Adult free agency is still in progress as the fall 2018 season is close to kicking off. 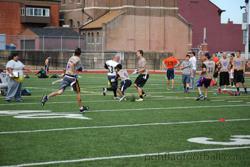 Several number of new players have signed up and are ready to compete in will be another good year for the Adult League. For those who haven’t registered yet as a reminder for either returning players or new players, September 1st is the deadline to register. The fee to register will be $95. Now when new players hear the word Adult free agency this simply means that once you enter and pay the fee, you will automatically be put on a team. This is for players who signed up without initially being part of a specific team. When they sign up to be a free agent they are evaluated based on a questionnaire that they will fill out. For instance, it will asks questions about fitness levels and what position that they will be drafted by once the league combine comes around. These evaluations are very important when not only taking the data from the combine but using this form to help find the right fit team for that player. There are multiple options when going in as a free agent. For instance, each player will have the decision to go in together as a package deal or form their own team. A package deal involves two free agent players being drafted to the same team. No matter what team picks them up, this grants them to be drafted together, which then, makes them a package deal. Also, when an adult player becomes a free agent that doesn’t mean they can’t form their own team, they can actually partner up with other free agents. No matter what as a free agent player, when it comes draft time, there will be a spot open on a team. 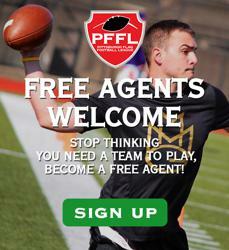 On behalf of the PFFl we would like to say good luck to all the free agent players in the new fall 2018 season.